Mark here, new-comer to The Good the Bad and the Podcast and co-host of the James Bond: Here and There series. Though this site is largely dedicate to cinema, we would be remiss in not giving a little attention to those wonderful packets of plot and profundity that provide so much fodder for movies: books! And if you’re anything like me, the number of books in your house that you haven’t read greatly outweighs the number you have. Well, I decided to do something about it, and set out to read 100 books in a year. “You’re insane!” I hear you shouting, but not so! The experience so far has enriched me beyond measure, and I challenge you to try it yourself. Wait, wait! Don’t quit reading yet; at least look at the rules I set for myself, and see if they don’t sound reasonable. Pick a date, and start reading! There you have it: simple. It’s been just over four months, and I’ve found it easier to keep up than anticipated. Audio-books really help pad the numbers, and you’d be surprised how many minutes a day you can fill with them: cooking dinner? Pop in your headphones! Long car drive? Bust out your aux cable! I even listen while mowing the lawn and working out. 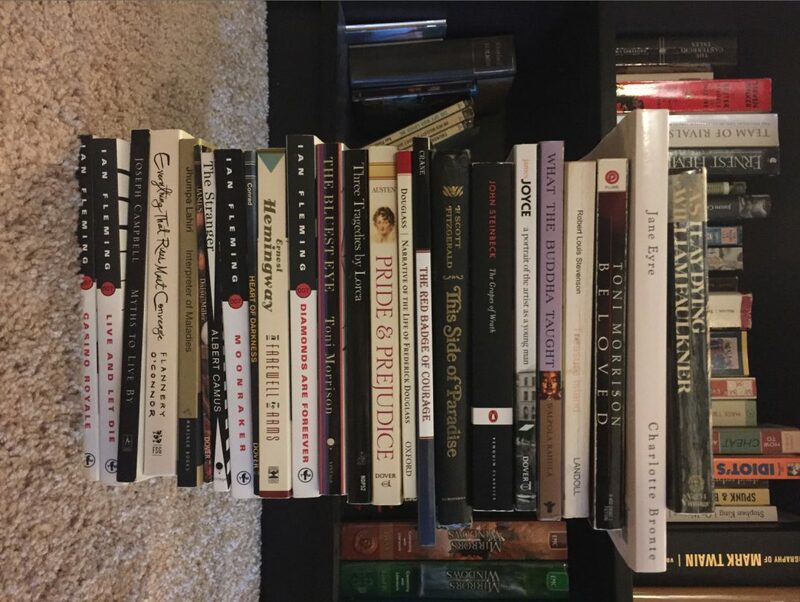 If any of you bibliophiles out there want to join me, I’ll write a separate post for every 10 books I read along the way, letting you know which I think are worth a gander and which you can skip over for something more engaging. Still don’t think you can do it? Try 50 books, that’s only one a week, and just imagine how informed you’ll be by the end! Come onnnnn. Crack one open with me and grab hold of some culture! Moonraker – Ian Fleming: James Bond novels are the perfect fit for the 100-book challenge. Short, well-written, and steeped in adrenaline, you’ll find them quick reads while getting a nice dose of popular culture (and admittedly some sexism and 1950s prejudice too). See our James Bond: Here and There series a more in-depth look at the books and movies. Myths to Live By – Joseph Campbell: As a general rule, I suggest reading everything by Joseph Campbell you can get your hands on. His work with mythology, religion, and story-telling in general has found its way into every corner of our culture. This book was a good read, and a good length for the challenge. Other works I highly recommend are The Hero with a Thousand Faces (his best known), and The Power of Myth (an interview with Bill Moyers, which reads much better than most interviews). Everything that Rises Must Converge – Flannery O’Connor: This is my TOP PICK for this post, and O’Connor is easily one of my top 10 favorite authors. This collection of her short stories held me spell-bound. They somehow sparkle with the grotesque as they explore race and family in the antebellum South. If you like stories that lift up the log of life and show you the rot underneath, pick up this book or her other collection A Good Man is Hard to Find. You won’t be disappointed. King Lear – some guy named Will: Considered one of Shakespeare’s top tragedies, I was surprised and delighted by how funny this play often was. The tale of an aged King who foolishly spurns his one faithful daughter in favor of her two, more treacherous sisters, the masterpiece expounds upon themes of old-age, familial betrayal, and redemption. A must read. Interpreter of Maladies – Jhumpa Lahiri: Winner of the Pulitzer Prize, this collection of short stories about India and Indian-Americans was enlightening, especially for an uninformed westerner. On the engaging scale, I’d only give it a 6 out of 10 for the general reader, but still well worth the time to read it. I mean, come on…Pulitzer Prize. Daisy Miller – Henry James: This novella is a quick read, and is often studied in literary Academia, but doesn’t have that immediate, startling beauty I look for in my prose. It tells the story of a young American girl visiting Europe, who refuses to hold herself to the Victorian social standards of the time, and how her actions impact the narrator of the story and his views on women and America. The Stranger – Albert Camus: Many of you may have read (or “read”) this one in high school, but go back and read it again! As an adult the novel struck my philosophical chords like it never could have in 11th grade. And it’s a nice, concise read too. Well that’s it for now. Got get to reading!